One of the most exciting novels I read last year was Yoon Ha Lee's Ninefox Gambit. It offered fast-paced space opera combined with a strange mathematical system that governs space travel, and society. Between the action, Lee has a thing or two to say about totalitarian states and oppression as well. Ninefox Gambit is the opening volume in his Machineries of Empire trilogy. The second book, Raven Stratagem, was released this month. This sequel pick up the story directly after the end of the first novel, but takes a slightly different approach. One would almost say a more conventional one. General Jedao, long dead military genius and war criminal, has been set loose on the universe again. With the Hexarchie threatened by the Hafn, there is a job to do. But Jedao is dangerously unstable, unpredictable and not adverse to killing large numbers of people. When he takes over a fleet of spaceships, the Hexarchs get worried. Jedao is quickly outlawed but that doesn't break his command over the fleet. With an external enemy ready to strike, an internal conflict reaching a boiling point and a rogue general on the loose, it is hard to see how the conflict can be resolved without massive loss of life. Nevertheless, some parties are trying to achieve just that. 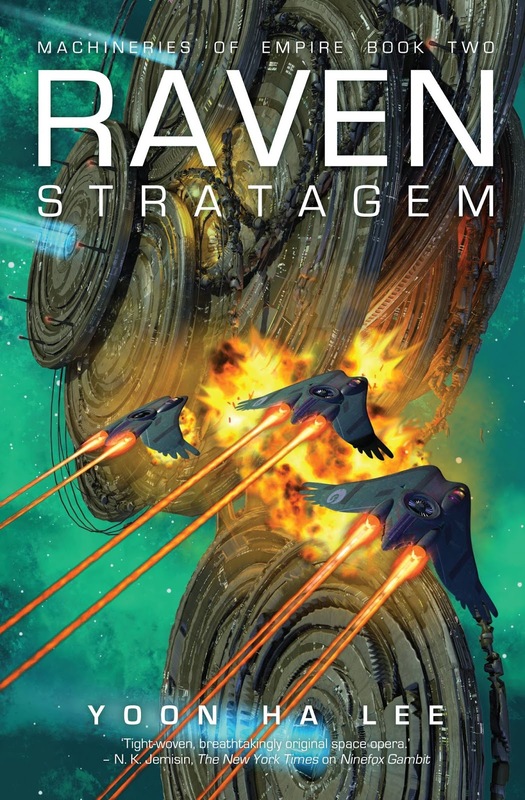 Raven Stratagem is not as heavy on space battles as its predecessor. There are a few to be sure, but most of the book deals with political manoeuvring. Where the reader gets thrown into the middle of the story in Ninefox Gambit, in this book we get to see much more of the political structure of the empire. It is a system everybody involved feels is rotten to the core. Every generation it becomes crueller, more violent and less tolerant. It takes more and more effort to keep within the narrow boundaries of calendrical orthodoxy. It is an empire rapidly approaching the breaking point. One of the more interesting aspects of the novel is that most of the faction leaders seem to be perfectly aware of the weakness of the empire and its slow, long descent into madness. Most of them are not prepared to change the tiniest bit in face of this problem. Keeping their position is more important. To raise the stakes a bit further, the novel explores immortality. It is within reach for Hexarchy elite. The price for society as a whole, would be considerable though. Imagine having your leadership staying in place for centuries, slowly going mad, without even the possibility that at some point they will snuff it and let someone else have a go. The hexarchs are not a cheery bunch, that's for sure. Most of the story was told from Cheris' point of view in the previous novel. In Raven Stratagem, Jedao/Cheris is not a point of view character. We get to see quite a lot of the general through the eyes of others though. Lee cleverly uses other points of view to show us what formation instinct, an effect of the calendrical system that ensures loyalty in the Kel soldiers, works on an individual scale. Loyalty, it would appear, is more complex than the mathematician who designed the calendar seems to have imagined. What has remained constant in these books is the oppressive nature of the society Lee describes. The almost casual way in which populations are subjected to horrible violence for even the minutest deviation from the norm is terrifying. More than once characters mention how they do not relish having to kill large numbers of people, but do so anyway. They seem to think their actions are inevitable, even when faced with the evidence of the flaws in the system. Part of the machine that somehow robs them of initiative and absolves them of personal responsibility. Lee's parting shot in this novel is particularly poignant in that light. The pace of the novel is perhaps a tad lower than the first book in the series. Apart from taking the time to show the reader a bit more of the hexarchate, Lee is also building up for the third volume. I wouldn't go so far as to say the novel suffers from middle book syndrome however, it has a strong story arc and definite climax of its own. It is clear that there is more to come though. One thing I wondered about at the end of the novel is the circular nature of the calendar, and what that implies for the future of the empire. All things considered, Raven Stratagem is a worthy successor to Ninefox Gambit. It is fast and lean space opera. A dark and grim story. The kind of novel that does not coddle the reader, but challenges to look beyond the explosions and window dressing, and explore such themes as the dark side of human social structures, and the meaning of loyalty and humanity in the face of immortality. This trilogy is looking better and better. I already look forward to the third volume.